Retro Cafe Art is at it again! Another WONDERFUL and FUN Swap is going on. I started making some for myself, and for some for the swap as well. These little guys are just plain addictive! This one is my fav with the Spider...he started out Silver with a light purple body, but with some Alcohol Inks and a brush, he became this gorgeous Gold and Rich Purple guy. Purple clock stickers from Graphic 45 Happy Haunting collection. This had Graphic 45 papers but the super Skeleton is from RCAG here and the Cameo Frame is here. The background stamps and Skull (1st Tombstone) are from Tim Holtz's Mini Halloween 3 set. Background paints from PaperArtsy and Fresco are perfect on the Masonite Tombstones. Here you see black chipboard Bats, Small Gothic Windows, and Ornate Circle Frames adorn this little guy. The Smiling Moon is from Graphic 45. You'll love the Halloween Collage Word Cutouts for so many things! The background stamp here is the Raven. Sticker is again from G45 Happy Haunting. The Skeleton paper is from the Steampunk Spells paper pad. LOVE the Bats and Spiders. Kristin has TONS of them in the shop! So give it a go, place your order and join the Swap! Well, now that the Surprise Party is over, I can show you the card I made for my daughter and her husband. We had a terrific time and it turned out great. Good friends, good food, great times! Since this was 25 years ago, her colors were Peach. Which she came to hate very quickly. So, my dear granddaughter specifically wanted to use that color.....as a tease. Do you know how hard it is to find PEACH anything????? I guess lots of people have found they're no longer fond of it. This is the front of the card....it's just silver numbers that were die cut and embossed. They picked up the peach color from something else.....eh. I used the Tim Holtz "Vintage Noel" die to get the "25" for the front and the Distressed Doily with crinoline. The Poppy paper is die cut using the Styled Labels die. I used black cardstock because with Silver, most other colors make you lose the Silver. This is the open card. Love Karen Burniston's Dies for this. She makes it so easy to create a really fun card. Some silver stickers, and edge dies make the card Shine! And the poppy paper from Graphic 45 was the perfect color....matched those fabulous (cough) dresses the girls had to wear! And here they are with us having lunch at Arthur's BEFORE the Surprise Party! 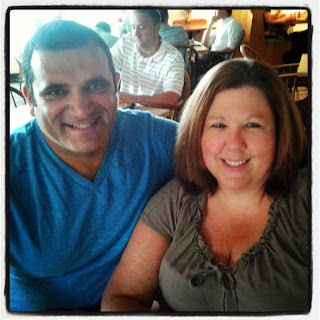 Happy Anniversary guys, I LOVE you both! Inkssentials™ - Surfaces Metal Foil Tape Sheets - 6 x 12"
Having said that, I received a fantastic Seth Apter Stencil from StencilGirls Products and I just had to immediately make a tag. This stencil has sooooo many elements, and so many sections with which to play! Start with a #8 Manila Tag and Grunge Paste. Slather it on and let it dry. Then I added Fresco Paints from Paper Artsy with Cut-n-dry Foam squares all over the tag and the Grunge Paste as well. When dry, sand the top off the Grunge Paste with a sanding block to reveal the Grunge Paste below. Sand gently and you'll still have stencil paste remaining for dimension. Then I spritzed a small portion of the tag with Black Marble Dylusions Ink Spray. Now I wanted to stencil with certain parts using Distress Ink. I used Seedless Preserves and Dusty Concord. This is a closeup of the stencil blocked off with painter's tape. Then, for some reason, I decided I wanted the letters really dark, so I added Super Fine Detail Embossing Powder in black, and heat embossed. I used an alphabet stamp set to add the DON'T with Distress Ink and then Clear Embossing Powder. I needed more contrast, so I cut a piece of colorful scrapbook paper a bit larger than the tag and layered it onto black chipboard. I added Spiced Marmalade DI to the paper and stamped with Ink and the Dog Minis from Paper Artsy using Coffee Archival Ink. Here, you see a detail of more stamping, and some Prima and Finnabair elements to fill in sections. Add some white paint to a Tim Holtz Word Band and buff off. Then a piece of Baker's Twine through the buttons. I added white Posca, black Gel Pen, and some colored markers to spice it up a bit more. Layer it all up, punch a hole, and add a piece of dyed Crinkle Ribbon to the top, and it's done! So take a look at all the cool stencils from StencilGirls Products, especially Seth's, and enjoy the possibilities! I was just informed by a very smart person that I directed the question of "why can't some people leave a comment here on my blog. I've had lots of people try unsuccessfully, and just give up?" Here is the response...let me know if it works for anyone. Your readers may have third party cookies disabled in their browsers. They must be enabled in order to leave comments in the embedded comment form. Just a little more Halloween Fun with a Retro Cafe Art Gallery kit, some Fresco Paints, and a few accents from Graphic 45 and Inspiration Emporium. This stuff is so addicting!!!! Some Spiders, Charms, Bats, and Stamps on the Fresco Paint background and it is just a HOOT! The Ravens and Spiders are accented with Ice Stickles. Check out those Skull and Crossbones charms!!! You've got to love the chipboard Spider Webs covered with Purple Ice Stickles and a little bottle of Poison that sits in the cubby!!! The bottle has Rust Alcohol Ink in it for color, and the Poison stamp is colored with Distress Markers and Distress Inks. Adding with Glue-n-Seal is really easy. The Tombstone is the smaller window piece just painted up. I used the clock from Happy Haunting papers and added Glossy Accents, a Spinner and a brad to a metal Vintage Mechanical Washer from Prima. Kristin just told me she's having a Random Wednesday Giveaway over on Retro Cafe Art Gallery's FACEBOOK page. 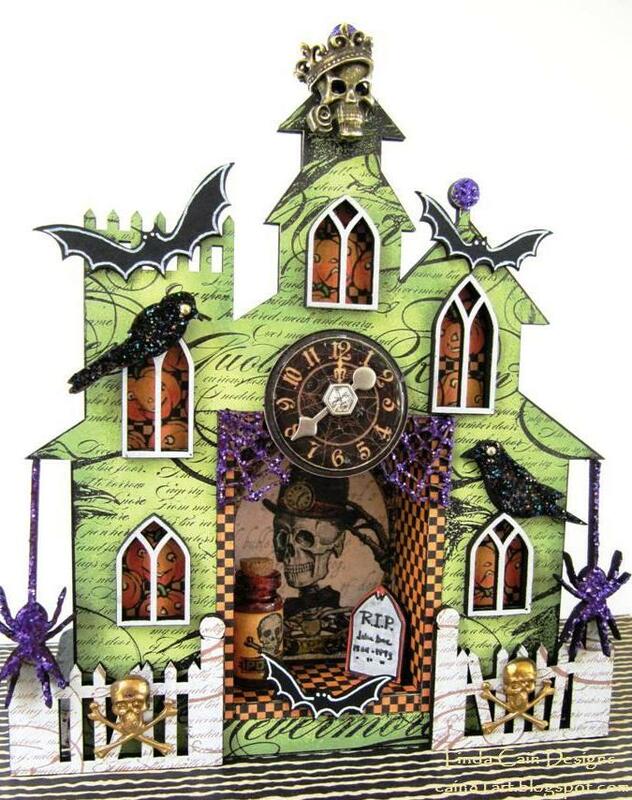 So if you want the Kit to make one of these really cool Gothic Haunted Houses....check out the link and enter to win a great prize here. And check out the other links for the rest of the products, too! Just a little reminder to get your Fairy Shines created and mailed into Kristin and Retro Cafe Art Gallery! Bill mailed mine yesterday for me! What a guy! I had to make just one more for the Inspiration Fairy Shrine Swap...it was very spur-of-the moment with the new Chipboard Bats....Charms....Stamps.....and German Scrap Wings. The background stamps are Halloween Stamps that are just too cool! Check them out! I always love making little Jack-O-Lanterns out of wooden beads and Liquid Pearls. Stuff a little green leaf into the top and they're cuter than cute! I used the Witch Hat from the Inspiration Fairy Kit-Halloween, but you could use a chipboard hat as well. Kristin has the new Steampunk Spells papers from Graphic 45 for the clock and bat that I jazzed up with some Glossy Accents. Get them while they're hot.... this is my new FAVORITE G45 paper collection!!!! And don't forget....the GothicTombstone Swap is now going on at Retro Cafe Art Gallery....Join the fun! I LOVED making this collage. I LOVE Gears and Watchparts from Retro Cafe Art! I LOVE PaperArtsy Fresco Paints and Grunge Paste! 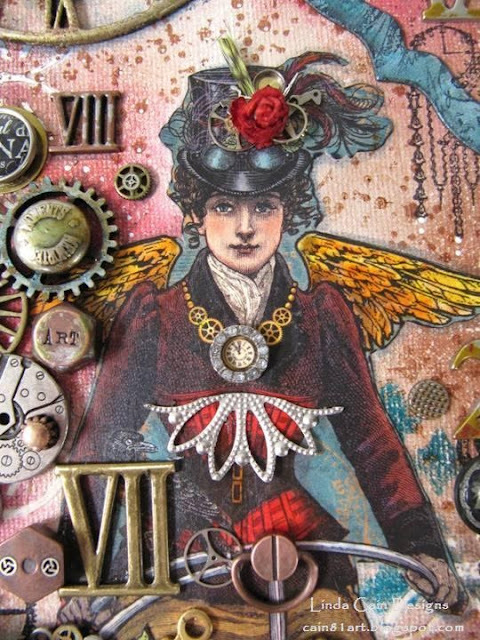 And of course, I LOVE Graphic 45 Steampunk Spells Paper! You get the picture.....This makes my heart sing! It's everything I love to work with....and it came together. I'll give you a little bit of a step-out. I started with a 6x12 canvas panel, Grunge Paste and a Prima Stencil. When it dried, I added many, many layers of Fresco Paints starting with browns and going on to Blood Orange and Claret. I added some more stencils with paint and stamped images to fill in space. I fussy cut the G45 12x12 papers and hand colored them with pens to make them brighter. I also had to make the Orangeness of the flowers more Burgundy. Sand off the areas of Grunge Paste stenciling to get a white image...loved how that turned out! Just keep adding and then walk away...come back later and LOOK at it. Move something. This is a detail picture of the UTEE on the Clock, the Propeller from RCA that is painted with metallic paints, and the Springy Thingy from the Mechanicals added with a Hitch Fastener. More stamps with ink and some with paint. White pen marks, too. See the Stone Paint stamped flowers and Ironwork images? I spent a good portion of the afternoon taking and editing pictures.........only to see that I'd forgotten to glue down 2 elements that are floating in the picture where they really don't belong. BUT, after talking to myself, (ha), I decided....WHO CARES??? She's a beauty, isn't she? I love the Gears, Flower and Feathers on her hat. Her bodice piece is from Finnabair (it's cut in half) as is the jeweled piece around her watch necklace. So you can see we all make really funny mistakes, and Life is Too Short to Sweat the Small Stuff! That's my story and I'm sticking to it. They're glued down in the final piece up top. Let me know if you think you can find the 2 Floating, unglued pieces. It should be fun! As always, check out the links below, and do your part to help the economy! Prima-Junkyard Findings-Nail Heads, Clock Parts, Bolts & Nuts, Jeans Buttons, Special Screw, Screw Heads. Fresco Paints, Grunge Paste, Mini Stamps-Gears, and Splatters. And many more pieces of ephemera and products too numerous to list!!! !